A gruel is made as required and becomes a routine breakfast cereal. It consists of nixtamalized Dent corn, flax seeds, sunflower seeds, wheat grains, and almonds. Each product is blended with water and added to a double boiler, which is the cooking pot used to prevent burning. Cooking is about two hours. The end product is stored in sealed plastic containers and frozen or placed in the refrigerator for current use. It can also be dehydrated and vacuum packed for long term storage. Along with a bowl of soy beans, two make a nourishing breakfast. 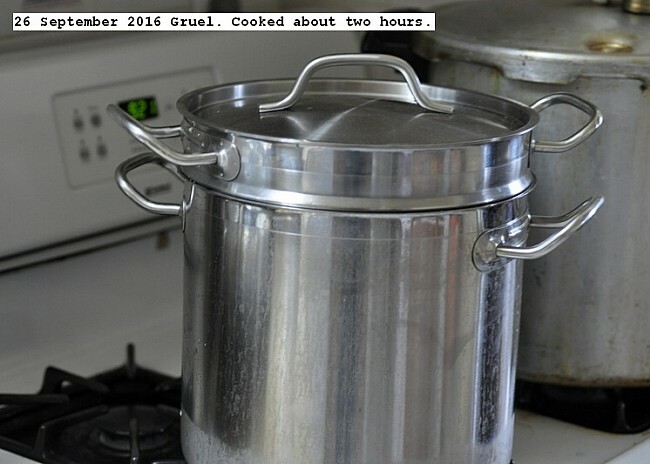 This entry was posted in Uncategorized and tagged 26 September 2016 Gruel, Gruel, Gruel. Breakfast Cereal. Bookmark the permalink.